The displayed posters and "zines," miniature magazines available for visitors, are the result of student group semester projects in a Great Lakes class, taught last fall in RIT's science, technology and society department. Shipwrecks, invasive species and industrial production are just a few topics of Lake Ontario researched by Rochester Institute of Technology students, with their findings on display until mid-May at the Port of Rochester terminal building, 1000 N. River St., in Charlotte. The displayed posters and “zines,” miniature magazines available for visitors, are the result of student group semester projects in a Great Lakes class, taught last fall in RIT’s science, technology and society department. Each display covers a different topic related to the history of Lake Ontario, with topics picked and researched by the students, said Kaitlin Stack Whitney, a visiting assistant professor who taught the class. “Many of the students were drawn to topics they were interested in, and all included social and historical research,” she said. They were put on display at the end of March to coincide with the fifth annual Genesee River Summit as a collaboration with the Genesee River Watch to inform people about the past and present condition of the Genesee watershed. “It is nice we can display them there so that people visiting Lake Ontario can learn more about how its past informs the present conditions,” Stack Whitney said. Other topics include a historical review of indigenous people who lived along Lake Ontario, micro plastics and pollution, and energy production along the lake in the past 100 years. 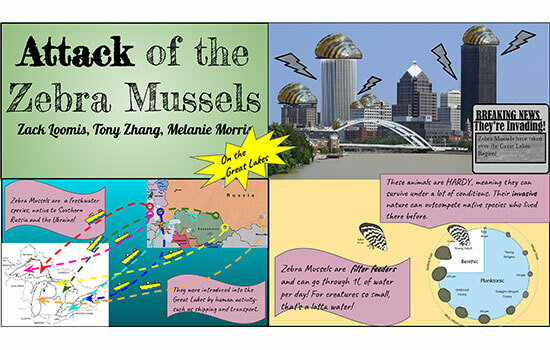 Zack Loomis, a third-year environmental science major from Erie, Pa., was part of a team that researched the impact of zebra mussels in the lake. Whitney said she plans to have her students do a similar project next fall.